Bryan Baello was born in the Philippines and lived there until the age of eight, when he immigrated to the U.S. and lived in Minnesota. 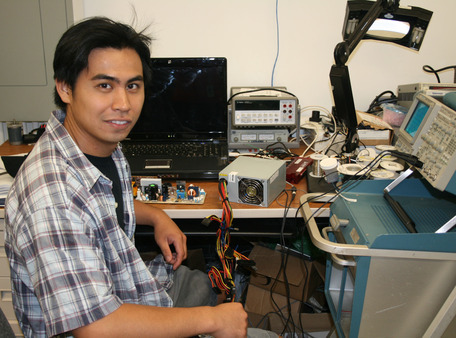 He moved to Maui by himself and is attending UH Maui College in the Electrical and Computer Engineering Technology (ECET) program. After completing his Associate of Science degree, he plans to earn a Bachelor’s of Applied Science at UH Maui. He likes to read, go hiking, fishing, and body boarding, watch movies, and do all the enjoyable things that there are to do on Maui. Vacuum electron-beam (“e-beam”) coating chambers are typically used for coating substrates. Substrates such as lenses and mirrors have an inherent level of “microroughness.” A smoother and flatter substrate scatters less light, which makes for a better optical element. The goal of this project is to polish substrates at sub-nanometer levels. This polishing involves taking an optical element such as a mirror, positioning it over the crucible area of the vacuum chamber, then using the e-beam to selectively erode or ablate the surface of the substrate. In order to complete this task, a variable-waveform sweep generator with fine control must be created to position and control the e-beam. A graphical programming language, LabView, was used to create a simulated function-generator. A LabJack data-acquisition device was installed as an interface with the LabView software: the LabJack converts the digital signal created by the LabView function generator into a real-world output voltage, which is then fed to the e-beam controller of the vacuum chamber. Two separate voltage signals are generated by the simulated function generator, and these signals drive the e-beam in the x and y-dimensions. This allows the e-beam to be steered and swept back and forth across the mirror surface that is being micro-polished.